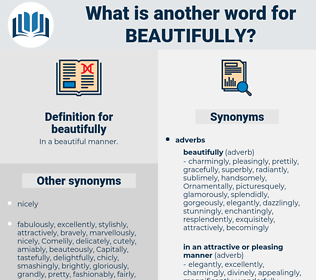 What is another word for beautifully? excellently, marvelously, brilliantly, admirably, eloquently, perfectly, lovely, pretty, divinely, better, seamlessly, fully, smoothly, neatly, belle, abundantly, finely, exactly, quite, absolutely, very, snugly, completely, eminently, great, entirely.
" You kept your patience beautifully," she told him. If so, they dreamed beautifully. bed pillow, beatable, beautiful, botfly, batfowl, biddable, bedfellow, bedevil, boatbill.